Perhaps the biggest compliment that you can pay to a festival such as Summerfest isn’t mentioning that it’s the largest music festival in the entire world. Yes, this is a huge feat considering the size of the festivals in Europe, but it’s still not the biggest compliment. The biggest compliment must be that every musician we seem to talk to views playing Summerfest as one of the highest honors that a band can receive. 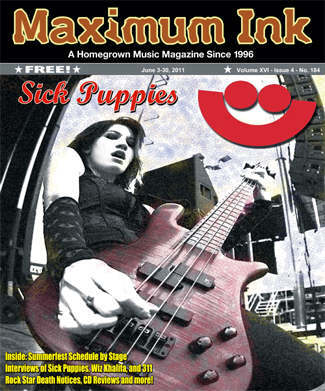 This idea is no different for Emma Anzai of Sick Puppies. Maximum Ink spoke with Emma about what an honor it is to play Summerfest, her past experiences there, and what’s next for the Australian rock ‘n’ rollers. Maximum Ink: You guys are slated to play Summerfest on July 6. What’s it like to be able to play the at world’s largest music festival and play on the same stage as some of music’s most talented musicians? Emma Anzai: It’s pretty surreal and I don’t think it’ll ever stop being that way for us. We can’t wait to check out the artists on this year’s lineup. MI: This won’t be your first time at Summerfest. Are there any cool stories or things you remember about it that you can share? EA: I remember seeing Paramore a couple years ago, and the crowd was huge. We stood up on the tables and chairs that were there to catch a view, and we hoped one day that would be us up there. MI: Out of all the big stages you’ve played over your career, what makes the festival scene such as Summerfest different? EA: The energy is raw and the vibe is exciting. You never really know how the crowd will react, and that in itself is a surprise every time. We love it. MI: Tell me about the new Tri-Polar Deluxe release. What can people expect to get out of the new package? EA: It has the regular Tri-Polar album plus the Polar Opposite which is our unplugged versions of eight songs off Tri-Polar. Also all the video plus unreleased B-sides are added. Everything is all in one. MI: What is next for Sick Puppies? New album, more touring? EA: We’re touring the States, and we’re also headed to Europe for some festivals. We hope to be touring until the end of the year.